A new focus has been going around the Pokémon series as of late; ever since Pokémon Black and White each Gym in the region and the Gym Leader at the helm are given more purpose within the community rather than simply being a place to go for Pokémon Battles. Burgh used his for his art exhibitions, while the Striaton City brothers ran theirs as a restaurant simultaneously. Drayden worked as the mayor of Opelucid City and Viola was a renowned Bug Pokémon photographer. For me this made the Gym Leaders even more interesting than ever before as they weren’t just obstacles along the way but genuine people who worked hard to be where they were today. Furthermore each Gym fit into their respective city seamlessly, each looking quite different from one another but never jarring against the aesthetic of the place they were situated. Thus when OmegaRuby and AlphaSapphire were released it seemed a little disappointing that the Gyms were back to the standard looking buildings, many of which could definitely not house the locales found inside. That being said our most unique gym this time embraces the new style of Pokémon gym more than the old. On the outside the Dewford Town Gym is just the same as any other in the region but on the inside it has a little more something than the rest. Almost entirely dropping the puzzle it had in Ruby and Sapphire, instead this Pokémon Gym doubles as an exercise Gym, for people! There are still pitch black areas but they seem installed for the sake of messing with trainers minds than actual usage by the patrons. One of the Battle Girls does in fact refer to the old layout which had the Gym set in pitch black corridors made to resemble the darkness of the ocean floor. It is a little disappointing to see Brawly seemingly lose that surfer boy image he had originally but it’s nice his Gym feels so modern in comparison to the others the game has to offer. Thus Dewford Town Gym stands as the most unique because it feels as if it’s the only one to truly embrace the new direction the Pokémon Gyms have taken since Generation V. Sure Petalburg Gym uses battle mechanics as its puzzle and Mossdeep Gym is the only double battle gym in the whole series whereas the battle with Brawly is truthfully not all that memorable, but Dewford this time really stands out for attempting to be something more than just a Gym for trainers to go earn their badges. 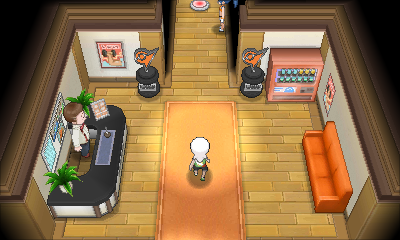 Also to seal the deal, there’s a vending machine inside the Gym, that’s got to count towards something! That’s all for Best, Worst & Unique with the Pokémon OmegaRuby and AlphaSapphire Gyms. Thanks for reading. I’ve gotta agree with you there; the gyms have gotten a lot better at being community hubs, rather than a get-it-and-go method of collecting badges. They’re also a lot more interesting now – they’re not just filled with blocks you push around anymore: they’re actual, interactive environments. It’s especially pretty on a 3DS!